Located in West Sedona, this semi-shaded trail guides you through interesting Red Rock back-country. Features and Interests: There is a natural arch located just over a half mile up the trail (at river-bed, has a dividing trail marked by cairns)...keep watching the rock wall to the north/right and you should spot it. Trail Description From the trailhead, the hike starts out flat through the un-shaded high desert. Shortly after the registration box, the hike follows the riverbed through a partially shaded meandering trail. 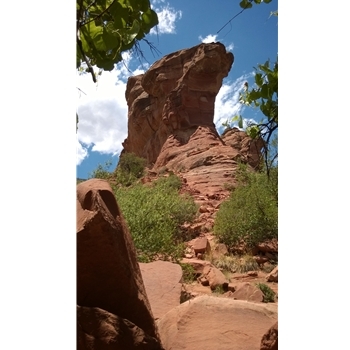 At just under a mile, the main Fay Canyon Trail ends at a rock-slide like area. The canyon is divided by a rock formation directly ahead which offers majestic views of Fay Canyon (if you choose to go up it). From the rock-slide, to the right, there is a primitive trail which leads further into this canyon. The destination about 1/4 mile is the Fay Canyon Vista overlooking some magnificent rock formations and other Sedona landmarks in the distance.